Open Outlook. 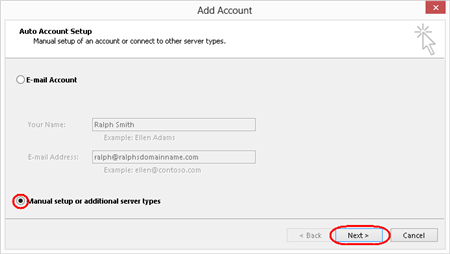 If this is the first time you have opened Outlook you will be directed to the new account wizard. If you already have an account set up, click File, then Add account and skip to step 3. When the Welcome to Outlook box opens, click Next, then Next again. Select the button marked Mannual setup or additional server types then click Next. Select POP or IMAP, then click Next. There is a lot of information to fill in on this next screen, let’s look at each section bit by bit. Your name: This is what most email users will see in their inboxes instead of your email address. Enter your name. E-mail Address: Enter your full email address. This is made up of the mailbox name you chose, an @ symbol and your domain name. you@yourdomain.com for example. 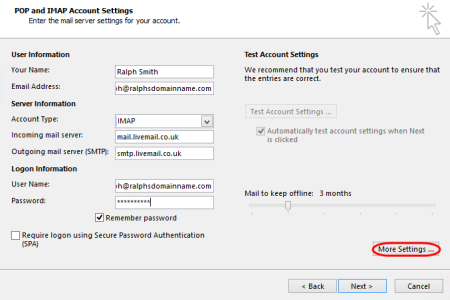 Account type: Depending on your preferred type of connection, select POP or IMAP from the drop down menu. User Name: Enter your full email address. This made up of the mailbox name you chose, an @ symbol and your domain name. Password: Enter the password you set up when you created the mailbox within your control panel. Remember password: Check this box. Require logon using Secure Password Authentication (SPA): Leave unchecked. Once you have entered all the information required, click More Settings. 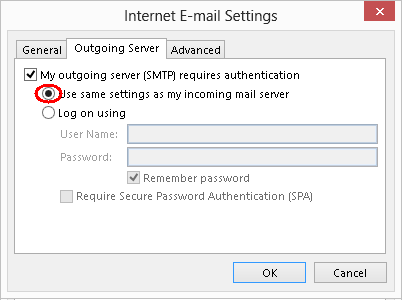 Make sure Use same settings as my incoming mail server is selected. 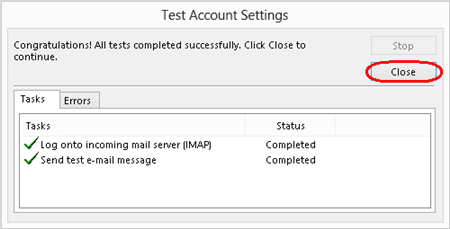 Incoming Server: 993 for IMAP or 995 for POP. 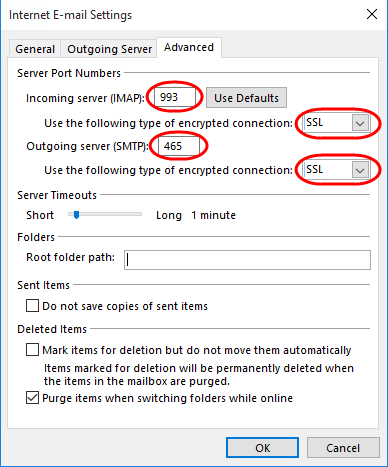 Use the following type of encrypted connection: Set to SSL. Click OK, then Next and Outlook will test the connection. When the test is complete click Close, and then click Finish to close the wizard. Outlook 2013 is now configured to send and receive email through your mailbox.